Nellie Gail Ranch, a community of beautiful homes located in Laguna Hills, is surrounded by miles of scenic trails and has a famous Equestrian Center centrally located near both the 73 Toll Road and the 5 Freeway in Orange County. The Nellie Gail Ranch community maintains five parks, more than 6 arenas, and approximately 20 miles of riding trails as well as many acres of open space for the residents to enjoy, making it really desirable for those looking for Nellie Gail Horse Properties . Search all of the Nellie Gail Horse Properties Homes currently listed for sale in the MLS, including those listed as short sales, foreclosures and bank owned. For more information about any of these homes, or if you would like a showing, please contact us via email, or by phone at (949) 888-6788. 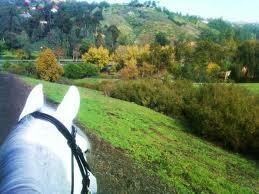 Read more about Nellie Gail Equestrian Homes. Proudly displaying timeless Tudor style, accentuated by extensive brick siding, bay windows, steep roof lines and angled wood accents, this classic Nellie Gail Ranch estate in Laguna Hills offers ample space inside and out. Approximately 4,855 square feet, the grand residence reveals 5 bedrooms, including dual masters, one on each floor, 3.5 baths, a great room with bar, an extraordinary wood-paneled office, billiards room and an airy loft. One of the great advantages for horse owners or horse enthusiasts is the Nellie Gail Equestrian center, but the community also offers one of the most dynamic and active residential lifestyles in all of Southern California. They have 3 Full-Service Activity Centers available to the residents and the public as well as terrific parks and trails throughout the community.